Welcome to MAESTRO! Don’t let its size fool you, MAESTRO is many features that will help you insure your aircraft is ready for a safe flight plus several features to help you diagnose problems and help you setup a new aircraft. MAESTRO can be configured to the needs of each pilot. The voltage alarm and warning levels are programmable as well as servo cycler positions; even the startup message can be customized to display your name and AMA number if you like. MAESTRO can be configured at the factory for you or with the addition of a low cost interface you can configure the parameters yourself. MAESTRO is very simple to use! Only 1 button, 1 red light and a small display packaged in a small enclosure. Several operating modes are supported, to start MAESTRO simply connect it to your radio system, using the charge jack, and you will see the startup display and your systems no load battery voltage. Press the button to read the loaded voltage, press the button one more time and MAESTRO will calculate your battery packs cell impedance! If the battery voltage is below a user defined limit, MAESTRO will warn you that your batteries are getting low. If your batteries are below a critical limit, MAESTRO will tell you not to fly! MEASTRO will fit in your pocket, or your flight box making it easy to always have the tools you need to make sure its safe to fly. 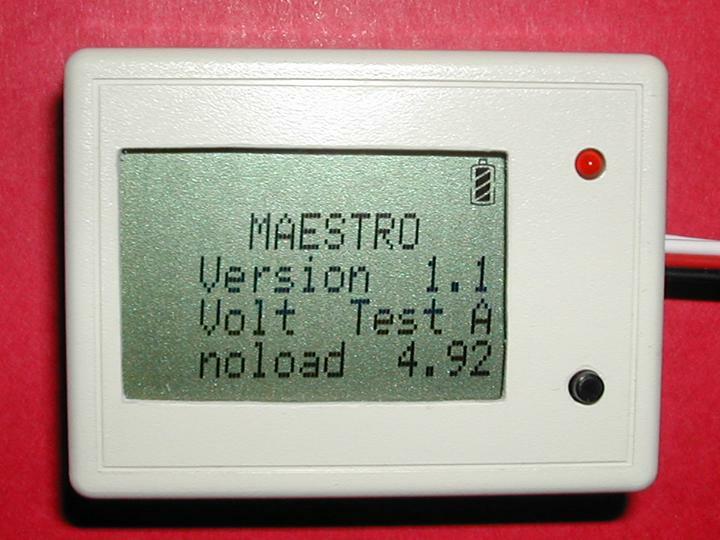 MAESTRO’s voltage test options can be programmed at the factory for your convenience or you can purchase a programming adapter. Connecting cables are also configurable at the factory. The MAESTRO always comes with both male and female connectors for added flexibility and support of servo cycling modes. The full manual (pdf) is available for the Maestro as well as an order form (pdf) form.